detention facility of the Lagos State Police Command, after allegedly inflicting serious injuries on her daughter, Aishat. Punch Metro learnt that the 30-year-old Ilorin, Kwara State indigene, plugged an electric iron and pressed the hot surface on the body of the 16-year-old, injuring her in the two legs. 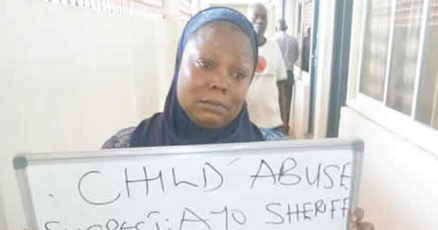 A Punch correspondent learnt that the offence of the teenager was that she lied that her mother was with the sum of N250 which she (Aishat) was supposed to give to her (Aishat) boss. The case was said to have been reported at the gender section of the police command headquarters, Ikeja, which arrested the suspect. The state Police Public Relations Officer, SP Chike Oti, said the incident happened on Tuesday, April 24, 2018. He said, “The Lagos State Police Command is investigating a case of child abuse reported by Chosen Child Orphanage Home, located on Gastya Estate, Ijora Badia on behalf of Aishat Sheriff, a 16-year-old girl child whose upper and lower right limbs were allegedly burnt by her biological mother, Ayo Sheriff, with an electric iron after a minor misunderstanding. “The victim, who is a pupil of a secondary school and a part-time student nurse, was given N500 by her boss with an instruction to give someone N200 on her way home, use N50 as her transport fare and return the balance of N250 the next day. “However, on the day she was supposed to return the balance, she defaulted. She told her boss that the money was with her mother. The boss called her mother on the telephone and the mother denied knowledge of the money. Oti said the state Commissioner of Police, Edgal Imohimi, became angry on sighting the victim’s injuries, adding that the police boss expressed worry over increasing rate of child abuse and domestic violence in the state. He said Imohimi advised parents to correct their children in love. It was learnt that although Ayo and her husband lived together with the children, the husband was always away from home due to the nature of his work. 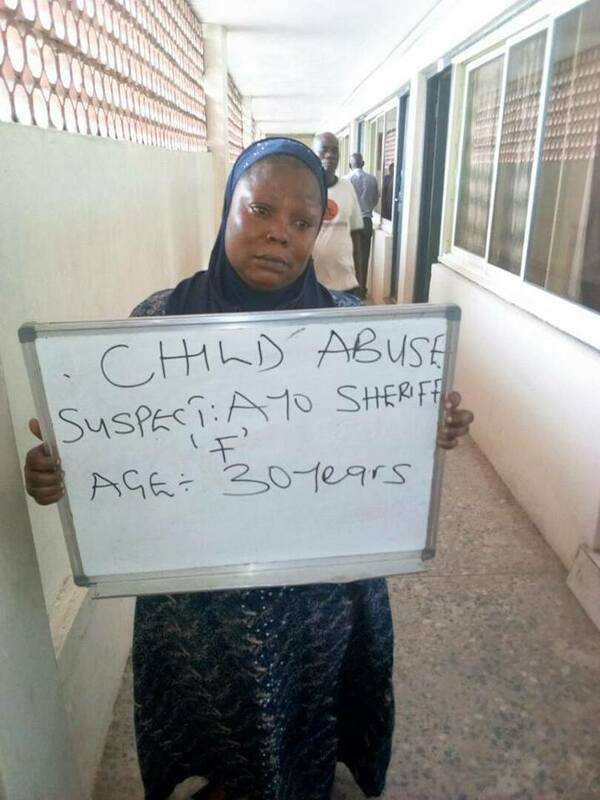 Punch Metro gathered that Aishat and her two siblings were put into the custody of Chosen Child Orphanage Home in the interim. Oti said the gender section of the command, headed by SP Adejoke Cole, had concluded investigation into the case and would charge the suspect to the Ikeja Magistrate’s Court on Monday, April 30, 2018 (today).